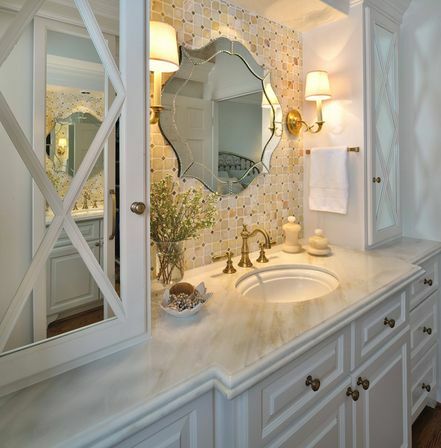 Sometimes you want to complement the room something original and exquisite, for example, to figure out how to decorate a mirror with your hands by using elements similar to the existing in the interior or combined with it. 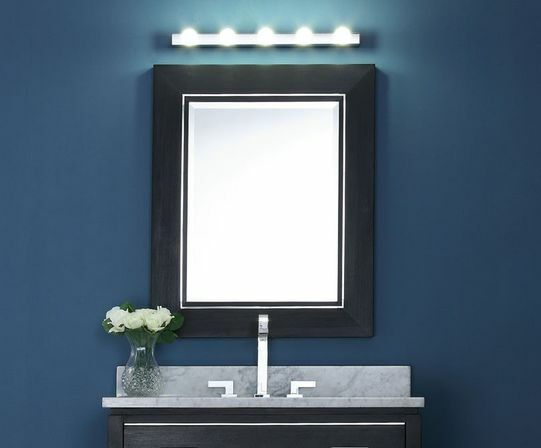 Even the most ordinary mirror without frame can turn on unique bathroom mirror. 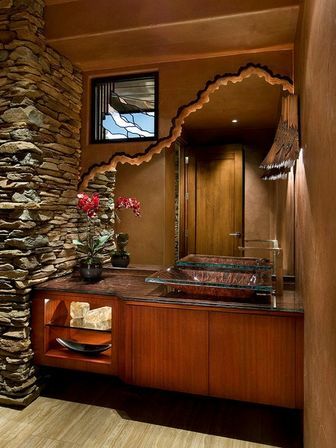 elements of decor should include details that were used in the interior of a particular room. Technology can be used very different: engraving, painting, mosaic and other. Materials too. You can use any “glass drops” for aquarium or colored beads, pebbles and shells, beads, crystals, wooden items, acrylic, adhesive films, ceramic chips. 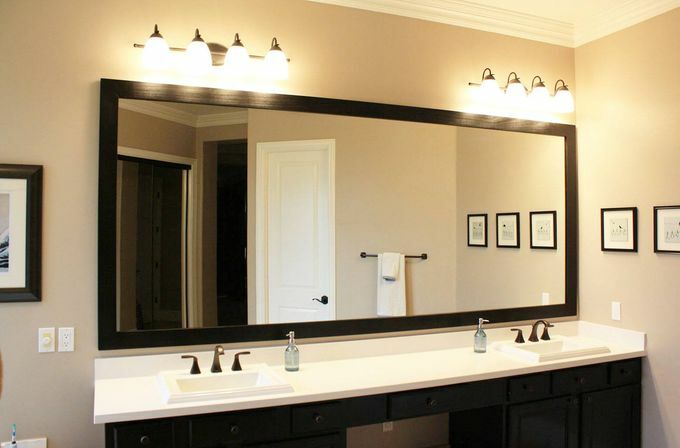 Is it possible to make unique mirrors for bathrooms without frames? Yes, but first, you can buy a frame and then decorating. But it is possible to manage and without it, adapting instead the plywood. You need to cut a piece that is greater in size than the mirror, and attach the hanger. 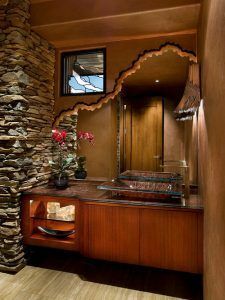 Then glue on the edges of the circles, sawn wood, or any other material that matches the style and color with the interior. The final stage is attaching to the plywood mirrors. To create imitation stone on the frame first, using the swab should be applied thick white primer so that the surface was covered with pimples. Then the same way to apply acrylic paint to a gray color, which added talc or starch. When the surface is completely dry, you need to choose paint in accordance with the interior, mix them and apply on several areas of the frame, trying to keep the borders between different shades blurred. The topmost layer is the light gray paint applied with a swab (to the surface is not lost roughness). If the mirror is in a wooden frame, it is possible for the decoration to use the technique of decoupage. To do this, the frame lightly with sandpaper and paint with white paint. 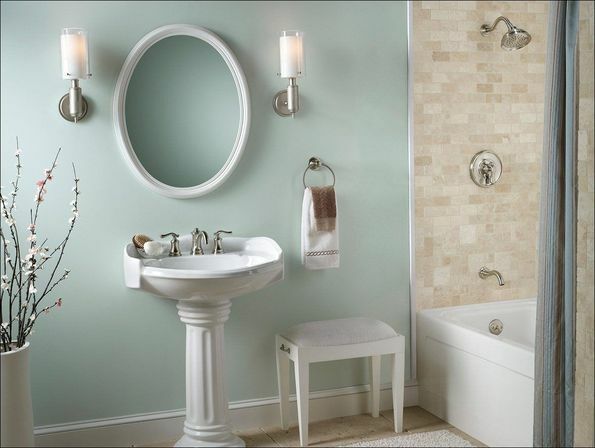 When the paint has dried, the glass must be thoroughly cleaned with water and detergent (to degrease). 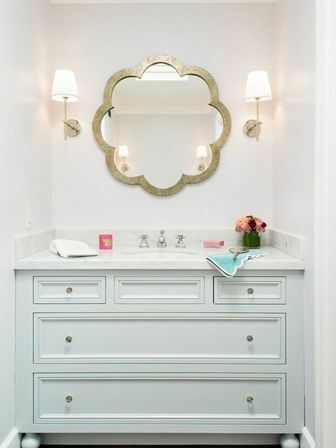 If the house has accumulated a lot of “jewels” (sequins, earrings, pendants, brooches), which no one have not enjoyed, they may well be used to make the design of the mirror with their hands. The frame should be lubricated with silicone sealant or with special glue and use the tweezers to spread out on the surface of the “jewels”. Every to pin down a bit. 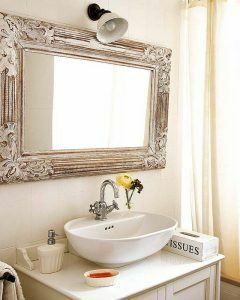 If you work carefully, the mirror surface is not stained. Instead of “family jewels” you can use seashells, sea glass and pearls. The mirror surface and all materials that will be used for decoration, are processed with water detergent or ammonia (degreasing). First you need to glue the large shells in between to place pebbles and pearls. The remaining free space, covered with a layer of glue, you can fill with sand. After the adhesive has dried, the excess sand should be shaken off, and the decor covered with a layer of colorless nail polish. Beautiful frame is obtained, if it to stick the beads. This material reflects light, so you can obtain an unexpected effect. 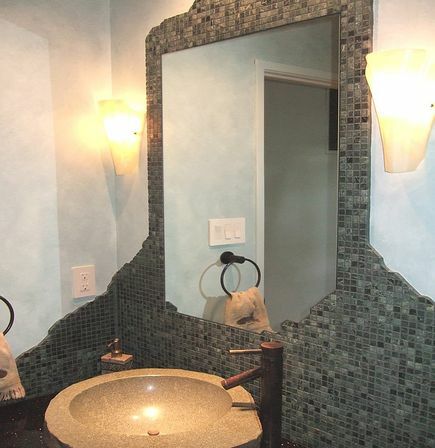 The beads should be selected so that its color go with the color of wall finishes, curtains, etc. For bonding is best suited silicone sealant. The mirror surface, which will remain free of decoration, you must isolate with duct tape. Frame and piece of glass, which will be applied to the decor, it is best to degrease, then apply sealant. The beads are poured in the sealant and is distributed so as to obtain a fairly even layer. The beads can be mixed with a transparent stones of small size. 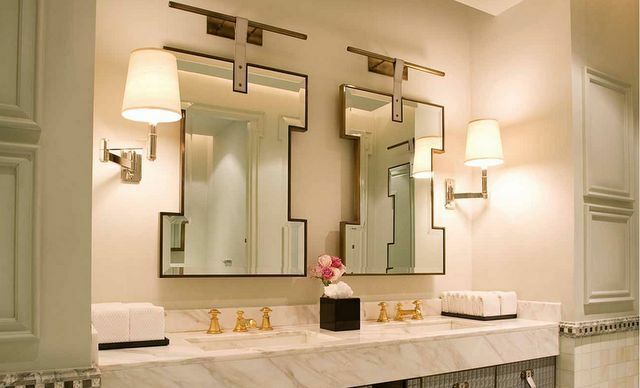 This method allows not only to decorate the mirror, but also to conceal the defects (scratches or chips), i.e., to effect restoration. 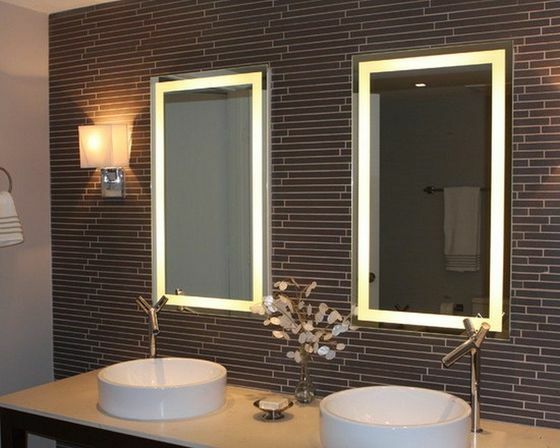 For walls that are tiled, perfect mirror, whose frame is decorated with ceramic chips. After repair there is always the material, including tile. You simply crumble, cover frame transparent mirror silicone sealant and sprinkle this crumb. But do not have to use only ceramic chips. It can be mixed with beads or sequins, which will give the frame body and Shine. 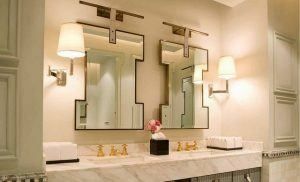 Another option for the room, the walls of which are tiled – the pattern on the frame or the mirror surface, the same pattern on the tile. 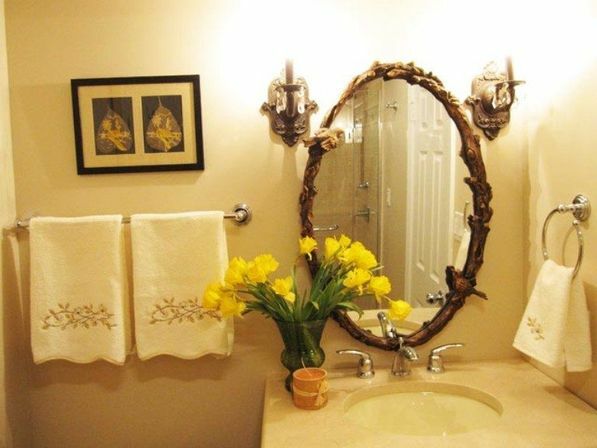 To do this, choose the appropriate paint color and seal the surface which will be decorated, tape. 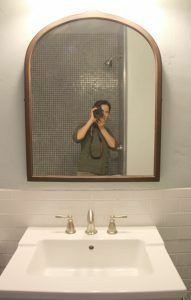 If the picture on the tile is simple, you can try to reproduce it by hand. For applying a complicated pattern it is best to create a stencil from adhesive tape, glue it to the decorated surface, and after drying to remove. Be sure you can create a special thing for interior – unique mirrors for bathroom. 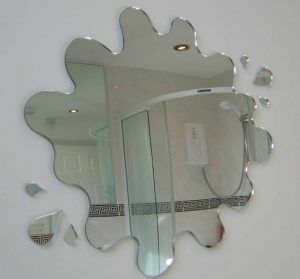 Even the old mirror surface chipped and scratched after appropriate processing can become an interior decoration!